The core for this Suite is the SysMetrix Skin N-Gage-Ment III by JuniorCrooks. As most of the community knows, not all desktop themes start with a WindowBlinds. JuniorCrooks made a very nice SysMetrix skin and then presented it to the community to see if a skinner was willing to make a WB based on it. Wouldn't you know that someone would take up the offer. Thank you very much k10w3, nice job. I have added some skins from the WC Gallery Libraries that I thought went with the theme and helped fill out the Suite. 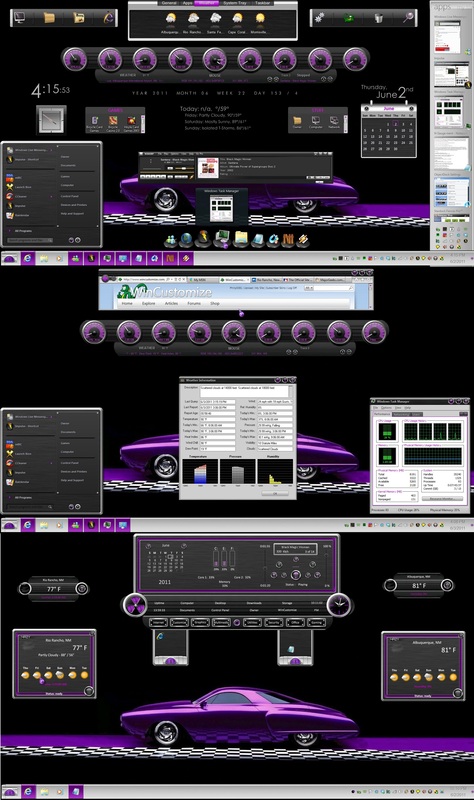 Be sure and check out the SysMetrix and DX Theme skins. They both provide some nice options for your desktop and some extra things like an audio or media player. Don't forget Fences and Tiles and ObjectDock either. With the Windows Taskbar, ObjectDock and now Tiles you can take your pick of which one you use to see your open apps. You can use all the skins listed or a mix of them to create your own very personal and unique desktop. I hope you enjoy this Suite and as always, have a great day. Very nice. Thanks to everyone that had a part in this. Looks great Philly! And wouldn't you know it. My Purple version of Vortex walls goes great with this! You are very welcome JuniorCrooks.